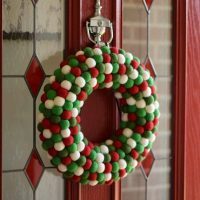 While you’re decking the halls this year, you probably will want to get a wreath for your door. 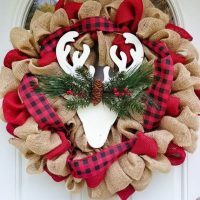 You might even want to get several wreaths to put on different doors throughout your home. Wreaths also can be beautiful hanging on your walls. You could just go to the store and pick up a regular old Christmas wreath made out of pine sprigs. 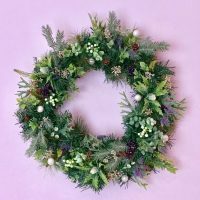 But while the classic Christmas wreath does have traditional charm, maybe this year you want to go for something a little bit different. Today, I have that “little bit different” for you! 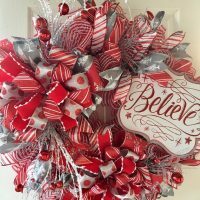 In this video tutorial, I will teach you how you can make a stunning Christmas “wreath” using an old picture frame and a couple other simple supplies. My focus here on DIYnCrafts this Christmas is on easy holiday crafts. In that spirit, I have endeavored to come up with one of the simplest Christmas wreath projects I could. There are only a handful of supplies required. It shouldn’t take you more than a few minutes to create the entire project. Below, you can view all the tools and materials you need along with written instructions to go with the project video. Let’s begin creating our Christmas wreaths now. 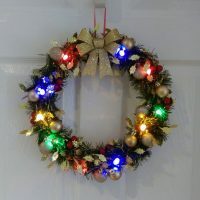 Looking for something a little different from the standard run-of-the-mill Christmas wreath this year? I have the perfect project for you. In my newest video tutorial, you will learn how to create a quirky Christmas “wreath” using an old picture frame and some ball ornaments. Check it out! First, you will need a picture frame to work with. The size, shape, and material of the frame are entirely up to you. What you choose will determine the overall style of your Christmas wreath. Start by removing the glass from your frame so that all you have remaining is the frame itself. Next, gather an assortment of ball ornaments to use. Once again, you get to decide the sizes, shapes, colors, and designs. 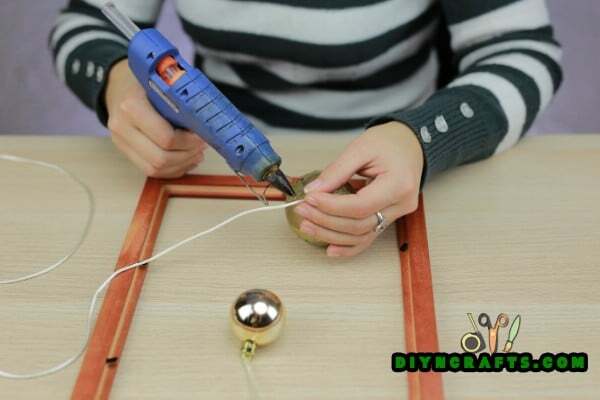 If there are hooks or loops attached to the ball ornaments, use a pair of scissors to cut them away. Grab a long piece of string or twine. Pull it through one of the ball ornaments where the hook or loop usually goes to hang the ornament on the tree. For this project, we want each of the ball ornaments to be hanging from a solitary string. 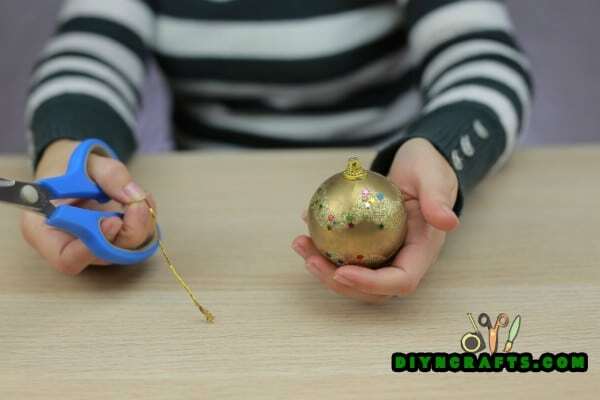 In order to achieve this, you can tie a knot to attach the ornament to the string. You can then use a bit of hot glue to get that extra bit of string out of sight. This will also help to secure the knot you have created. Then, dab on some hot glue to attach the top of the string to the frame. 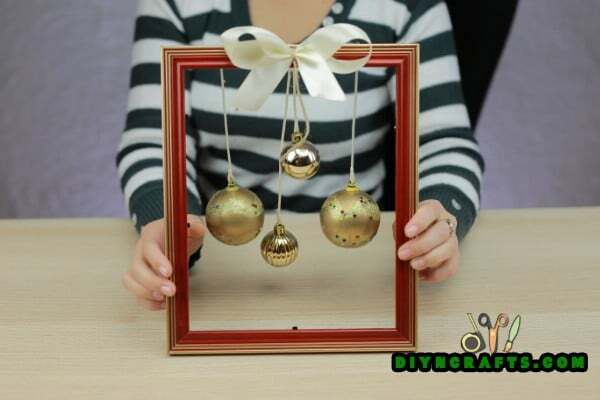 Make sure that you are doing this on the back of the frame so that it will not be visible when you hang it up. 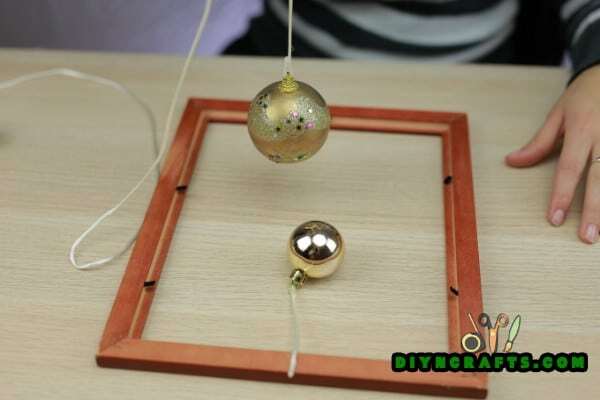 Follow these steps with each of the ball ornaments. 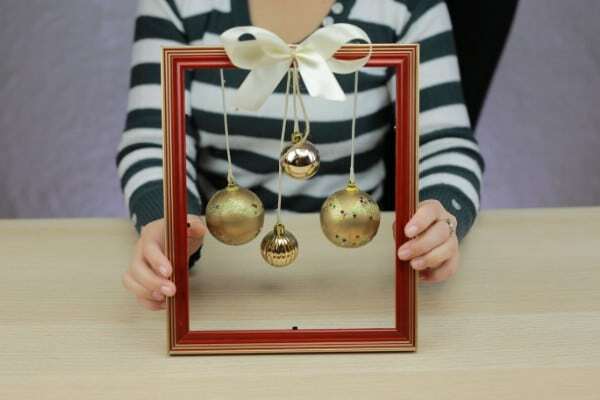 As a last step, you can attach a bow or any other festive embellishments you want to the frame. I recommend staying fairly minimal with additions. Simplicity is the appeal of this project. Once you have finished, your Christmas wreath is complete and ready to hang anywhere you like. Who would’ve thought it is possible to create something so magical out of a plain old picture frame and some regular ball ornaments. And who would’ve dreamed that it is so easy? What I really like about this project isn’t just how easy it is, but how versatile the final outcome is. 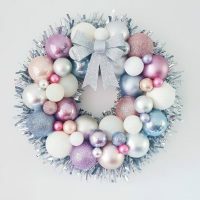 With its minimalism and the eccentricity of the concept (using a picture frame in place of a wreath), to me it has a very “modern” flavor—especially if you use a frame that is square or rectangular. But at the same time, there is a rustic Christmas vibe going on as well. That seems like it should be a contradiction in terms, but sometimes it isn’t. This is especially true if your frame is made out of a traditional material like wood, and you are using twine as opposed to a different kind of string. Perhaps it has to do with the whole idea of taking something which was designed for one purpose and using it for another. It is easy to picture folks in rural locations during simpler times doing just that around the holiday season. 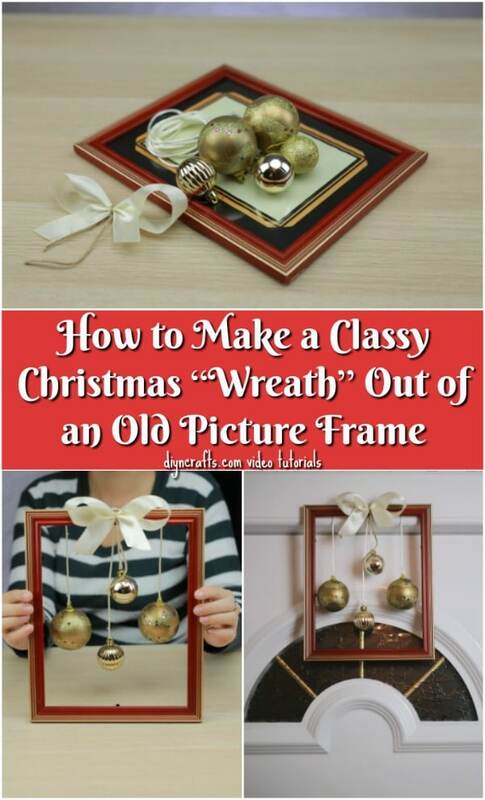 After you have finished making your Christmas wreath out of an old picture frame, it is time for more crafting! Plenty of simple holiday projects await you on our site, so explore all of our videos, and enjoy!